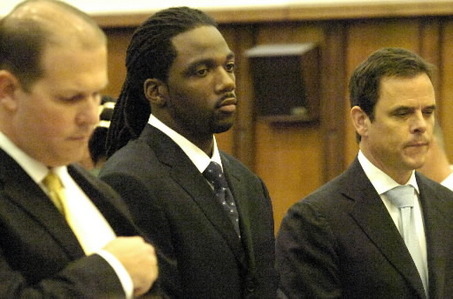 Today there was news that Donte Stallworth plead guilty to involuntary manslaughter for killing someone while driving drunk. As part of the plea deal he will serve 24 days in jail, 2 years house arrest, 8 years probation, a lifetime drivers license revocation, and 1,000 hours of community service. He also agreed to a financial settlement with the family of the victim. The NFL is expected to suspend Stallworth for his actions, but the length of the suspension is yet to be determined. This got me thinking about the NFL conduct policy as it relates to suspensions. In a quick Google search, I found at least 18 DWI arrests of active NFL players in the last three years, with many more before that. A study by the San Diego Union-Tribune found that 73 players on 2008 NFL rosters had been arrested for DWI, and 28 percent of all NFL player arrests were related to drunken driving. In 1998, Leonard Little was arrested and charged with involuntary manslaughter for killing another driver while he was drunk. He served three months in jail and an 8 game suspension from the league. He was arrested again in 2003 for another DWI. Eric Warfield racked up three DWIâ€™s in a four year stretch. Leon Hall, Chris Henry, Koren Robinson, Odell Thurman, Chris Chambers, Marcus Coleman, Adrian Awasom, Reggie Williams, Dwayne Jarett, Deltha Oâ€™Neal, Marshawn Lynch and Brandon Marshall have all gotten DWIâ€™s. Their reported BAC levels were between .092-.149.